Patriot America Plus addresses the insurance needs of non-U.S. citizens looking for temporary medical insurance coverage while traveling outside of their home country. The plan offers coverage for medical benefits (including the Acute Onset of Pre-existing Conditions), emergency medical and political evacuation, repatriation and a choice of deductibles and plan maximums up to $500,000. 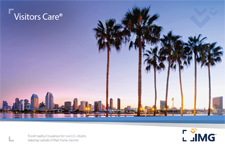 Visitors Care offers a broad package of scheduled benefits for individuals traveling and/or temporarily residing outside their home country for a minimum of five days. There are nine separate options based on deductible levels and maximum limits. Simply select the option that best fits your needs. Additionally, the Visitors Care plan offers excellent benefits and services to meet your global needs. You have access to international, multilingual customer service centers, claims administrators who process claims from all over the world, handling virtually every language and currency, and 24 hour access to highly qualified coordinators of emergency medical services and international treatment. This invitation to inquire allows eligible applicants an opportunity to inquire further about the insurance offered and is limited to a brief description of any loss for which benefits may be payable. Benefits are offered as described in the insurance contract. Benefits are subject to all deductibles, coinsurance, provisions, terms, conditions, limitations, and exclusions in the insurance contract. The contract does contain a pre-existing condition exclusion and does not cover losses or expenses related to a pre-existing condition. This brochure contains many of the valuable trademarks, names, titles, logos, images, designs, copyrights and other proprietary materials owned and registered and used by of International Medical Group, Inc. and its representatives throughout the world. © 2007-2015 International Medical Group, Inc. All rights reserved.